Fall Running and Orchard Valley Giveaway! Fall is my favorite season to run during. I'm lucky enough to live close to a really nice running trail called the Perkiomen Trail and the views along the trail during this time of year are just to die for! I love running over the bridges, seeing all of the beautiful leaves changing colors, and just overall enjoying some time away from the grind weaving in and out of nature on the trail. The weather this time of year is just SO perfect for running as well. It's still normally brisk in the mornings when I start running but not TOO cold yet, so it's the perfect weather for knocking out some miles. I try to get outside every Sunday and fit in a long run if my schedule allows. I had enough time the past two weeks to fit in 10 miles! My little leggies were sore come both Mondays after those runs :) Running ten miles is no joke though and I always make sure I wear a hydration belt when I'm going to be doing some serious distance because staying hydrated while running is SO important. It's also so important to listen to your body after that long of a run: sometimes I don't eat much before I go out (I tend to run best when I don't have a huge breakfast) but then by the time I'm done running I'm HUNGRY! 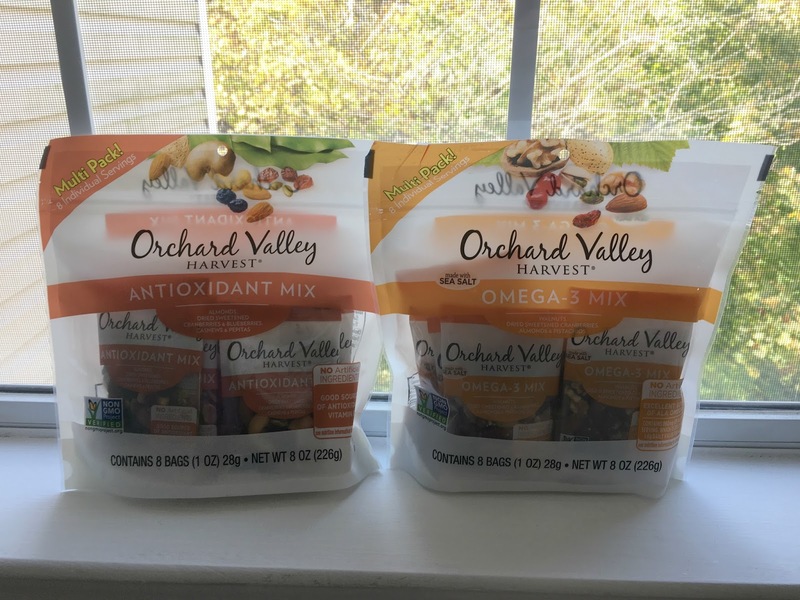 The new snack wellness mixes from Orchard Valley Harvest have been the perfect post run snack for me this fall. Two new flavors were just released this month and are now available at Safeway, Albertsons and Walmart! My favorite is the Omega-3 mix which has walnuts, dried sweet carnberries and blueberries, almonds and pistachios. This little one-ounce pouch has 55% of your daily value of Alpha Lipoic Acid! The Antioxidant Mix is really yummy as well and is a great source of Vitamin E from it's mix of roasted almonds, dried sweetened cranberries, blueberries, roasted cashews and pepitas. The two different blends are all non-GMO, contain no artificial ingredients and are available in multi packs! The best part of these mixes though is that they are SO convenient for taking with you on the go. 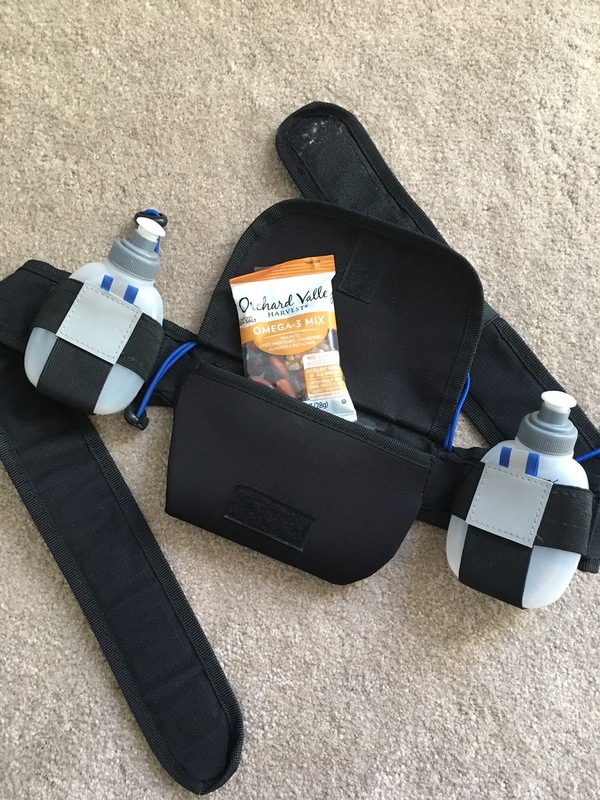 My hydration belt I wear while running has a small pocket in it that the little pack fit in perfectly! No extra bulk and so easy to just grab and go a perfectly portioned, healthy snack. Even if you are not a runner, these mixes would be perfect to take outdoors for a hike this fall, out to the pumpkin patch, or any other activies you have planned this season! So tell me: what is your favorite outdoor activity to do in the fall? 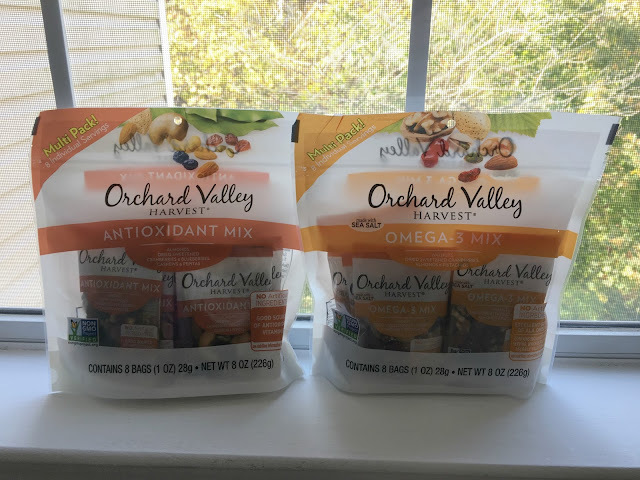 Comment on this post and enter using the rafflecopter widget below to be entered to win a $50 Visa Gift Cars and the new Orchard Valley Harvest wellness mixes! My favorite fall activity is watching all the leaves fall!!!! I live in Michigan, so when the leaves change, I love just walking and looking at the colors! I live in the south so the fall is perfect running weather! I love hiking in the golden leaves and taking lots of pictures. The crisp weather is the best!! That chicken bake looks delicious by the way!! Yum! I live in New Hampshire, so I love going to see the Fall foliage and going hiking to see the trees at their highest peak! Love raking leaves with the family. Love running in the fall weather! I love taking my daughter to do all the fun Fall outdoor activities - pumpkin patches and things like that. She's almost 2, so I get to be a kid all over again! I love walking and looking at how the leaves are all changing color. The time of year where I'll cut out my daily bus rides during my commute to work and walk. I live in California and it starts to finally feel brisk I'm the morning. It's perfect weather for walks with my coffee. -Monica B. My favorite activity is definitely hiking! Watching the colorful leaves on the ground is amazing. I absolutely love going hiking and seeing all the different color leaves on the trees as I go! Fall is the best season! Love the corn maze and hiking without sweating. Fall is the perfect weather to go hiking. I really enjoy hiking in Valley Forge National Historic Park and the surrounding trails. Fall? I live in south Texas & we barely don't have fall! Ha! When the weather cools off I am always saying, "it's running weather." My favorite thing with fall weather is being outside. Camping, running, or cooking out are my favorites. I love running when it's overcast and maybe a little rainy! It makes me feel alive! I enjoy hiking in the woods. I like walking on the beach. I like to go on nature walks near the lake. I love being out in my gardens in the fall doing clean up, planting bulbs and pruning up as needed. The smell of the earth and leaves is just wonderful! I love going for walks in the Fall.. the trees with the leaves are so beautiful and make for a nice time. My favorite fall outdoor activity is hiking in the mountains, especially as the leaves are changing colors! I love going for walks and foraging for wild hickory nuts, wild grapes and apples! Visiting the pumpkin patch and doing fall walking with my family. My favorite fall outdoor activity is hiking. I love hiking and apple picking! My favorite fall activity is hiking in Acadia National Park in Maine! The storms of fall are my favorite part! I live in Oregon and I have a love for the rain and wind that comes every fall, we go for walks and collect leaves and apples. I like going on nature walks in fall. I love fall running! But also love playing in the leaves with my dogs and husband. We like to go on walks and go to the park. My favorite fall activity is hiking! It's so beautiful outside during fall, and it's generally a perfect temperature outside. Going for hikes and long walks! My favorite outdoor fall activity is walking in the park and taking pictures of the leaves changing colors. I LOVE TO HIKE AND TAKE WALKS.